The Nukes are far more than a ukulele band. Part vaudeville, part rat-pack, part musical car crash, this talented trio deliver an engaging mix of humour and originality that audiences of all ages will love. The innocent little uke is the instrument of choice and people will be staggered by what the Nukes are able to achieve with it. Great song-writing, musicianship and 3-part harmony combine to create a truly memorable, entertaining experience. The Nukes have carved themselves a cozy niche in the cutthroat world of the New Zealand ukulele scene over the last 10 or so years. Many roads have been travelled in the decade since, many songs have been sung and many challenges overcome. With the soul-wrenching retirement of the inimitable Snapper Thiele, the Nukes have seized the day and embraced a fresh set of possibilities. Dave and Ben have recruited multi-instrumentalist Mike Burrows and have already performed dozens of gigs together, from Dunedin to The Coromandel. The sails have been set, the charts checked, it should be plain sailing from here! 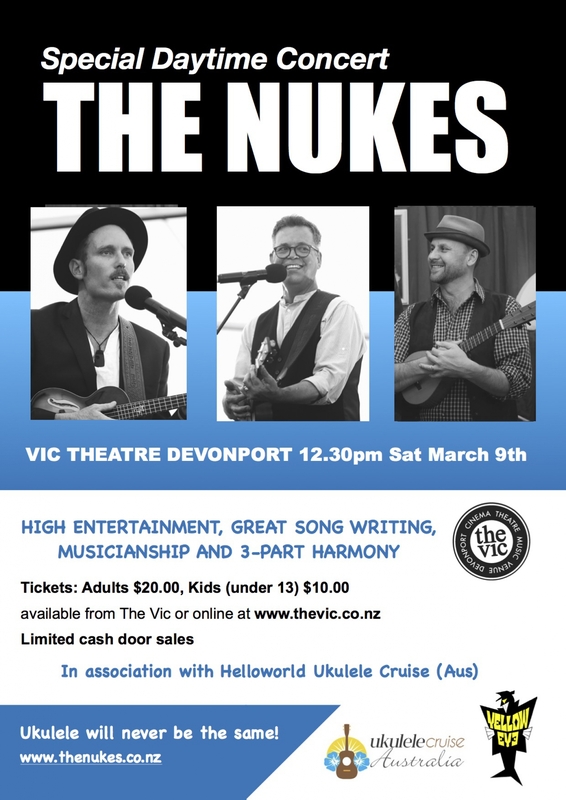 Come and take a peek at what musical concoctions these new Nukes have been brewing as they return to the Vic at Devonport for a special lunchtime show Saturday March 9th from 12.30 . New tunes with a new face along with a trusted back catalogue, lashings of off-the-wall humour plus a swag of surprises.